The building’s on fire! Hurry, update your FB status! Last night was unforgettable. Tara and I were relaxing on the couch when we were interrupted by an urgent pounding on the door. I opened it to find my neighbor in a bit of a panic. “The building’s on fire!” she said. Scaring a lot of friends in the process. Hell, when I typed that, I believed that our building was on fire. I’d hurried outside after my neighbor, and saw thick gray smoke pouring from what appeared to be the end unit of our building. We’re on the far (opposite) end of an 8-unit townhouse in a condominium complex with sixteen buildings. So I fired off that Facebook status update while Tara, perhaps more wisely, began packing a bag of belongings. Hey, there’s a reason they’ve got me doing a presentation on social media at the big company symposium this September. A moment later, we discovered our building wasn’t the one on fire – it was actually the building next to ours. Thankfully, because the fire spread quickly, and turned into a three-alarm blaze. The way it quickly spread through the attic and across the roof, damaging or destroying nine units and leaving sixteen people homeless, I believe we would have lost everything had it been our building. By then, the FB comments were rolling in. Your house is on fire, and you’re on Facebook?!?!?! one person asked. Why, yes. Yes, I am. The whole neighborhood gathered outside to watch the firefighters battle the blaze. I was impressed by their calmness under fire (literally), and by their courage and professionalism. They had a job to do and they did it, without complaint. Following on the heels of the Arizona wildfire tragedy a few days ago, I am especially thankful for them. Tara and I were scared for awhile there. At one point, it looked like the fire would blow up out of control, and it could have spread to our building – you never know. Obviously, flames are unpredictable. We started formulating a serious game plan. If forced to evacuate, we would grab the cat first, and then the laptops. Our record collection. Maybe a few lava lamps. A handful of clothes. Tara had brought the fireproof safety box downstairs, which confused me, because isn’t that the one thing that’s safe to leave behind? Then again, it contains valuables, so I get it. Despite the gravity of the situation, I couldn’t help but chuckle over some of the Facebook comments, even while I continued to upload photos as the event unfolded. What can I say? My friends know me well. Ummm…remember school fire drills? Yeah, DO THAT!! Stop drinking and stop, drop and roll. Too bad it’s not bbq day or roasted marshmallow day. You’d be set! Was that your bottle rocket, Mark? So, a pretty scary evening, and not one we had envisioned. By 10 PM the fire was contained and things began settling down, so we headed back inside, only my brain refused to rest and I spend several hours tossing and turning before finally drifting off to sleep. Not surprisingly, I dreamed of fires and natural disasters. I should sleep good tonight, though – and then I’ve got four days off. Haven’t had that long a stretch since Christmas. Hell, I’ve only ever had one three-day weekend this whole year. I welcome the break! Here are some pics of last night’s fire and this morning’s aftermath. 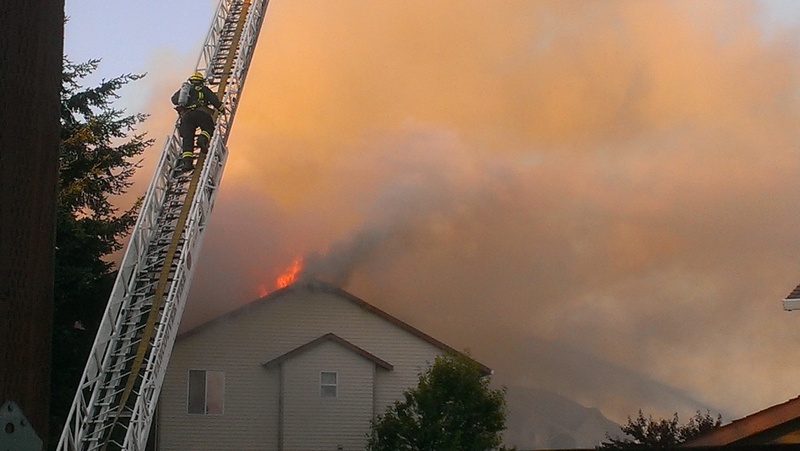 Fire spreads through the attic to the roof. Shell-shocked residents watch in awe. Local news crews on the scene this morning. The morning after. As bad as the fire was, it could have been worse. Having lost a home to fire, I can relate to the emotion of those who were standing there watching their house go up in flames. I have to ask, was the Red Cross on the scene? Red Cross disaster action teams here in the Metroplex respond to apartment and house fires quite frequently. Yes, they were. I read in the link (or another article) that they are offering emergency assistance in the form of food, shelter, and supply kits. I’m sure those poor displaced residents are very thankful for that. So many people don’t know that the Red Cross responds to these types of emergencies all the time. Volunteers are on call round the clock to provide comfort and care not only to residents but also first responders. I’m glad to know they were there and glad to know your home turned out to be unharmed. Scary, scary stuff! We lived through a fire once and even though we didn’t lose anything, except for a place to live, it’s something I wouldn’t ever want to live through again. Glad you are both okay but I really feel horrible to those who lost EVERYTHING. Tara told me about the garage fire. Scary stuff. I feel bad for the displaced people, too – but am glad that nobody (human or otherwise) was hurt. It is a scary situation though. The Red Cross is wonderful. When the house my daughter was sharing with friends burnt down the Red Cross was there almost immediately and helped so much! You have THE most ecclectic blog I follow. I’m glad you are all okay. I definitely like to mix things up and keep it interesting. Plus, a lot of weird things seem to happen to me. Weird things that I can’t resist writing about. At least I keep you guessing! OMG, Mark…what a scary experience!!! I remember a few years ago, when one of the generators in my apartment building caught fire and the alarms went off for us to walk downstairs into the street. I was so panicked I didn’t know WHAT to grab first. I suddenly grabbed my wallet and my laptop, that’s it. Luckily, the fire department got here fast and extinguished the fire. No damage other than the apartment building having to purchase a new generator. Glad to hear you and Tara are safe. And sending good thoughts to those people who were involved. Have a great 4th tomorrow, buddy! That’s the thing. You really don’t know what to grab at first. Somebody on Facebook actually told us to save our record collection, which seems like such an obvious move in retrospect, but had never occurred to us at the time. Have a “blast” tomorrow, Ron! Wow–I have a huge fear of fires–love fireplaces–contained flames–but the out of control freaks me out. At the same time, I find it hilarious that your first impulse is toward social media. That says a WHOLE lot about you. I’m not sure what, but it says something. Something infernal? I hope not. But think about it–social media is what lead you to Tara–so it makes sense on some level that you might respond that way. After all, you do have the hots for her, do you not? Happy 4th to both of you. May it be blazin’. I’m not sure what it says either, Kathy. It’s probably not flattering, LOL. But at least Tara is there to keep me grounded. Love your comments, by the way. They SIZZLE. Have a great 4th of July, even if you don’t get to experience fireworks! If you ever get displaced, you and Tera come to my place for as long as needed. Ironically, this is what a great deal of the country has become. On the other hand, writing a letter just isn’t the same. YIkes! I’m glad you’re both ok. How scary. I remember two bad fires in my neighborhood when I was growing up and it is a horrible and scary thing to watch. I try to donate to families when I know about it so they have some spare clothes and toiletries. So hard to put your life back together when you’ve lost your home. I’m glad everyone was safe at least. You’re a good egg, Jess. Channeling the Red Cross spirit on your own. I’m impressed! I remember seeing this on FB! Now I’m trying to catch up on my reading. You updated your FB status first? !